Rudy Adrian’s Lotuspike debut, MoonWater, was a beautifully crafted study in deeply serene and contemplative soundscapes. His new release, Desert Realms, follows that same stylistic path, exploring the spectacular stillness and vast landscape of the American Southwest desert. Rudy’s compositions are by themselves both vast and serene, but an additional level of emotion is provided by the poignant and moving flute expressions of Nick Prosser on a few of the tracks. 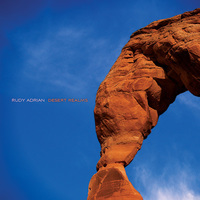 Prosser’s stirring musical statements interact with Rudy’s vast soundscapes, filling the spectacular sonic vista with just the right amount of life and feeling; reminding the listener that although the desert realms may appear at first stark and barren, they are in fact full of life and captivating beauty.